Feeling the cold? Hop abroad on a plane and escape the January blues! There’s nothing better than a spot of Winter sun when the temperatures are plummeting and thankfully Damart still has all those holiday essentials available, even at this time of year. The ultimate sunny weather must-have is this Embroidered T-Shirt that you can team with anything from trousers to shorts to skirts. It’s the perfect day through to night piece. Made in 100% soft cotton jersey, it feels cool and breathable too – ideal for your holiday wardrobe! But what you’ll love most is the gorgeous floral embroidery detail that comes in a choice of four colours – blue, black, mint and mauve. Another holiday essential is our stylish Cotton Stretch Cropped Trousers. They’re designed to give you all-day comfort and a flattering fit thanks to the touch of stretch. Plus the cotton means they’re cool and breathable too. They look great with vests and t-shirts, flip flops and heels, so wear whether you’re strolling along the beach, sightseeing or out for dinner in the evening. Best of all, this style are amazing value from only £9.50 and come in every colour under the sun so why not treat yourself to more than one pair? 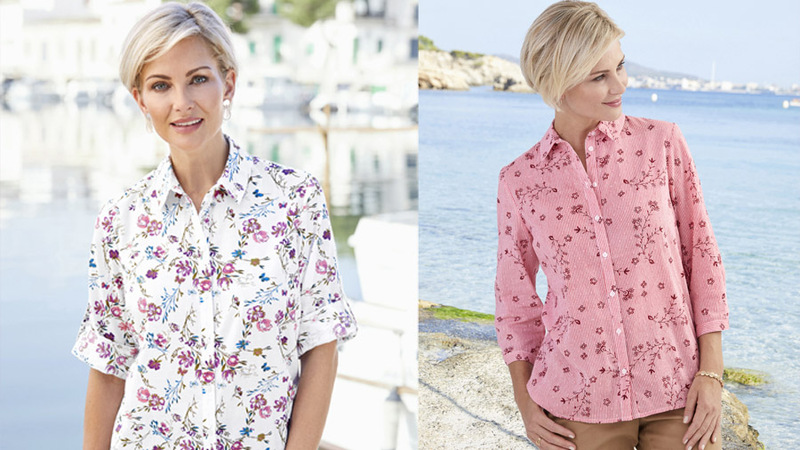 Floral and feminine, this pretty Printed Blouse will look great in your holiday snaps! In pure cotton, it’s cool, comfortable and lightweight with a loose, flattering fit. Plus with ¾ sleeves that you can also tab back and wear shorter, it’s a versatile blouse that gives you two different looks. Wear with your cropped trousers during the day and a nice maxi skirt when the sun sets. Choose from two Summery floral designs. With a casual fit and a stylish look, our pure cotton Print T-shirt is a great addition to your holiday wardrobe. You’ll love the flattering scoop neckline and the striking floral print that will brighten up any outfit! Take your pick from four fantastic colour choices – orchid, khaki, mint and navy. Be beach ready in our Crinkle Trousers that no suitcase should ever be without! This pull-on pair is ultra-cool and comfortable with a loose fit, yet gives you a chic look in an instant. They’re the ultimate holiday essential thanks to the crinkle fabric which packs easily and washes and dries overnight. With so many colours to choose from and a not-to-be-missed buy 2 – save £4 multibuy offer, don’t get on the plane without them! Designed to make you look and feel great, our stylish Swimsuit boasts a chic blue and white polka dot pattern. The wide side panels give the illusion of a longer body and a nipped-in waistline. This easy-care costume is one you’ll wear again and again – a great addition to your holiday wardrobe! Want a bit more coverage? Then for body confidence on the beach or by the pool, our tropical print Swimdress is the solution for you. Essentially a swimming costume with a skirt bottom, this one-piece gives you cling-free coverage over the hip area and is designed to smooth and flatter your figure. It comes in two colours and features soft cups and wide straps giving you not only support, but a great shape too. Finally make waves with our gorgeous cobalt Swimsuit– adding a pop of colour to your poolside look! Boost your body confidence with its flattering drape front detail, cup support and full body powermesh that holds you in and helps smooth your shape. You’ll look and feel fab all holiday! So grab your passport, shop your Winter sun suitcase essentials at damart.co.uk today and get packing! How do I purchase one of the swimsuits you have shown? Thanks for getting in touch – we’re glad there’s something you like on here! You can purchase the swimsuit online by following this link https://www.damart.co.uk/C-243561-swimwear and selecting the style you like. If you need any more help please don’t hesitate to get in touch.